then we can address the final component to resolving mental health disorders in retraining brainwave patterns for long term sustainable results. Your brainwave patterns are unique, no two people are alike, as your brainwave patterns over your life are determined by the way your brain has developed, possible traumas you have suffered, whether that be head injury, or post traumatic stress response, nutritional deficiency, hormonal dysfunction or other means where the brain function performed inefficiently at any time through life, and became a permanent pattern. Just as our brain neurotransmitters that keep us happy affect our mood, behaviour, mental function and clarity, so too do our brainwave patterns. Because of these anomalies affecting individuals so vastly, QEEG testing prior to training with Neurotherapy is absolutely essential for optimal results in retraining those poor brainwave patterns back to a normal range designed right for you. QEEG is a painless assessment tool used to identify mental health conditions detecting subtle variations in the activity of the brain. Subtle brain wave variations might otherwise go unnoticed by your doctor or health practitioner, but the computer-based QEEG provides evidence of an underlying dysfunction that needs to be recognised, evaluated and treated. QEEG measures the minute electrical activity of a person’s brain by recording the brainwave patterns of up to 24 points on the brain for a period of five minutes through a specially designed cap placed correctly and able to detect brain wave signals. It is then sent for analysis where it compares that unique pattern to “normal” and “abnormal” patterns. As seen above, when reviewing your QEEG results the goal is to remain within only 1 standard deviation away from point zero. With each condition there is change in different areas of the brain more than 1 standard deviation from zero either +1 to +3 indicating an increase in brainwave activity in this area causing over-activity of the brainwaves as you see in yellow and red for ADHD, anxiety, and migraine, and where brainwave function is under-active below -1 to -3 seen as blue, a patient experiences low brain function as seen in depression, brain fog, poor memory and mental clarity. When we can understand how your brain is functioning at a brainwave level once nutritional, biochemical, and physiological function is at it’s optimum, then we can address the final component in retraining brainwave patterns for long term sustainable results for many mental health disorders. Below we see the image of a QEEG recording of a 78 year old male patient suffering depression, memory loss, and disorientation. Through testing with QEEG, the early stages of dementia were detected and prevention methods through Neurotherapy training were implemented along with nutritional support. 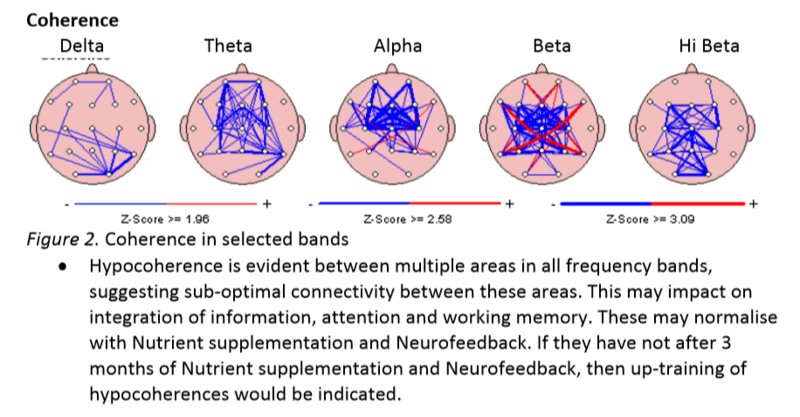 The blue lines indicate a lack of communication between each of these individual areas of the brain, making it very difficult to make decisions, and to understand once simple situations. Below we see an image of the before and after of an 11 year old child diagnosed with ADHD. The poor coherence in the first row indicate difficulty learning and concentrating, where after 30 sessions of Neurotherapy in a 4 month period has improved coherence considerably. Prominent in headlines today are discussions of the mental health of children. It appears that we are in the midst of an epidemic of Attention Deficit/Hyperactivity Disorder (ADHD). According to The National Association of School Psychologists, ADHD “look-alike conditions” include depression, stress-induced anxiety states, biologically-based anxiety disorders, bipolar disorders, schizophrenia, and other medical disorders. While children with look-alike disorders may meet the diagnostic criteria for ADHD, they may have an entirely different underlying physiological condition and, might more appropriately receive a different diagnosis, resulting in different treatment. If a medical or other psychiatric disorder is presenting as ADHD, a treatment that merely improves the ADHD symptoms such as medication alone, may leave untreated behavioural problems, mood abnormalities or health disorders in the body’s physiology. In such cases, even if medication commonly prescribed for ADHD, are helpful, or if environmental changes improve the child’s self-control, it is critical to insure that other, perhaps more serious problems are not left unchecked.This is where QEEG is invaluable in accurate assessment and identifying the correct treatment plan for the purpose of retraining with Neurotherapy. The National Association of School Psychologists (N.A.S.P. ), and the National institute of Mental Health (NIH) have warned practitioners of the wide variety of psycho-medical and bio-medical problems that can be mistaken for ADHD, or that may co-exist with ADHD, stressing that it is always essential for a child to be carefully evaluated. Combining the experience of our practitioners with the advanced testing facilities available at Advanced Wellness & Behavioural Centre such as QEEG, TOVA, Esteck, and functional pathology, we are able to accurately determine almost immediately what is occurring in the brain to design a health program unique to you for the most effective and best treatment available for your mental health condition. This testing regime leaves nothing to the imagination reducing treatment time and financial investment for efficiency in resolving your health concerns. – extract from an article by Professor Corydon Hammond. Physical Medicine & Rehabilitation. University of Utah School of Medicine.